Pure religion is practical. Oftentimes Christians are portrayed as theorists and Bible apologists who never actually do anything meaningful in our communities. While it is true that some have not gotten the biblical memo on this, those who live according to the Scriptures draw close to those in need. There are many who have no active father in their lives or positive male role models. Consequently, some find family bonds in gang life. There are many who learn their paradigms from others whose fathers abandoned them and that is obviously perpetuated in their mistreatment of women. Some of us had fathers who were mainly such biologically, but not in terms of love, nurture, reflecting the image of Christ in our households, and wholehearted provision. Not only are young men affected by fatherlessness. Many of our young ladies have been suffering beneath that burden. Some have had great daddies who have died at the hands of diseases, tragic accidents, or are absent due to incarceration. Others have either not known their fathers or were abandoned by them for whatever reasons. The results of fathers and or positive father figures being absent from the lives of young women are often manifest in depression, poor relationship choices, poor grades in school, behavior problems, deteriorating relationships with their mothers, and unmentionably worse. What the Bible is saying here is that those who embody the pure religion principle reach out to those who would otherwise become a statistic. We become available to young men and woman to model the interest and tender care Jesus demonstrated. We are not satisfied with simply seeing them and smiling. No. If we can share money, we share money. We do our best to be a shoulder to cry on. We invest time getting to know their likes and dislikes. We teach them valuable life principles. We make and keep promises. We pray for and with them. We encourage them to excel in all areas of life, and much more. In short, we take a hands-on approach and in many ways become a community of surrogates to them. In my adulthood, I experienced a few couples that became that for me, and in turn, I am learning to do the same for others. 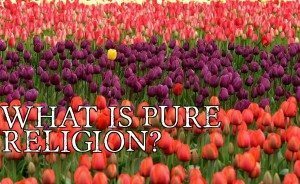 Pure religion is practical, helpful to others, and can be duplicated so others learn from our examples to do the same.